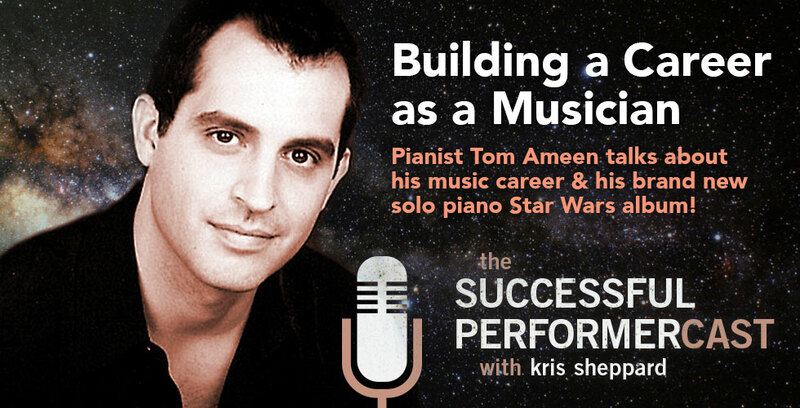 In this episode, Tom Ameen talks about how he’s built a successful career as a classical pianist. Topics include restaurant gigs, getting private parties, and selling albums. He also talks about his new solo piano Star Wars album, which is awesome! Tom has played piano since he was 12 years old and studied under acclaimed pianist James Tannenbaum at the Cleveland Institute of Music. He’s gathered a wonderful following around Los Angeles which has afforded him many opportunities to collaborate with some top names like Grammy nominated artist Jim Brickman, performing on many of his albums. Tom even found himself performing as J.J. Abrams’ personal pianist. He’s recorded many albums with Canadian-based label Somerset Entertainment, some of which are Wal-Mart exclusives, others to be found at theme parks around the country. My favorites are his albums that he’s put out which contain music from the Disney theme parks, and these have charted on the Billboard Top 10! Probably the most exciting of all, Tom has just released his latest album, Journey to the Stars which features renditions of his favorite themes from the Star Wars movies! ManageGigs: ManageGigs helps you keep track of all of your gigs online, without having to resort to spreadsheets. Click here to check them out and sign up for your free seven day trial! Audible: For Performercast Listeners, Audible is offering a free audiobook download and a free 30-day trial to give you the opportunity to check out their service. Click here to check it out! • Why he decided to move from Cleveland to Los Angeles and why he chose LA over New York. • Working with acclaimed pianist Jim Brickman. • Talks about how he happened upon and landed a gig at Vitello’s the restaurant he’s been at for three years playing four times per week. • Selling his albums at his restaurant gig. • Talks about private gigs. • The power of asking. • How he gets private parties. • Contacting companies that do weddings and events. • Tells about how he got a gig performing for JJ Abrams. • Launching and promoting his albums. • Getting approval and rights for his covers. • How CD Baby manages all the details for selling your album on all platforms. • Getting the word out about his albums. • Doing interviews on podcasts to promote his music. • Two of his Disney albums made it into the Top Ten on Billboard’s New Age list. • Shout out to Randy Crane and Stories of the Magic Podcast for introducing me to Tom. • Putting his own spin on songs that he covers while still keeping his integrity of the song and not sounding cheesy. He nails it! 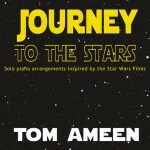 Journey to the Stars is Tom’s solo piano album of him covering his favorite themes from the Star Wars franchise. Tom did a wonderful job with these arrangements and you can check out the album on iTunes or CD Baby. We’re also giving away a free copy of his album to one lucky listener and here’s how to enter the contest: Go all the way down to the bottom of this page and leave a comment answering this question: If you had a droid that could do anything in the world, what would it do, and what would you call it? Tom and I will pick our favorite and the winner will be announced in the episode breaking February 12. Not being true to his calling in music. He wasn’t being true to himself and actually gave up on music for a while and getting a day job. It was one of the most miserable periods in his life. Getting on the Billboard Top Ten and putting out his albums like his new Star Wars album. Use your fear as fuel to go do what you want to do. The uncut version of this interview is available to Patreon Supporters and includes about 8 minutes of additional content. Please consider supporting me on Patreon. • Some fun banter as we talk about our musically inclined families. • The importance of validation of what you’re doing from people who love your art. His RSS Reader to keep up with all the news sources and blogs he follows. Where can we find Tom Ameen?